Well. We have lots to tell you so hope you’re sitting comfortably! On September the 10th and 11th we were in St Josephs with the robots! We trialled a new activity with the iPads called “Fix the factory” – the pupils were completing the levels quicker than me! It taught them the need for precise instructions and on the harder levels it taught them the importance of building up the code step by step which something we put into practise as a class with getting TechnoWall-E around the maze and using TechnoPups sensors. We were then down in St Michaels on the 17th and 18th with TechnoWall-E and TechnoPup in tow where we learnt about if statements and saw some very scary zombies walking around the hall and a very groovy robot disco! This was sadly Beth’s last session before she officially handed TechnoWall-E over to me. The pupils were awesome and really engaged with the robots – it was a lovely end to a fantastic year for Beth. On the 29th of September TechnoWall-E and I were out visiting year 6 in Glyncollen, Swansea. The children really loved TechnoWall-E. We crashed him into the maze, but luckily they were on task and TechnoWall-E was programmed through the maze in no time and made it out in one piece! Before we knew it, we were in October and out on the 2nd back in Glyncollen doing the unplugged session with a very excited year 5! We learnt about binary, and the importance of giving precise instructions by blindfolding half the class whilst the others programmed their partner to move around the maze. What they have learnt in this workshop will be put into practice later in November when TechnoWall-E and I go back. On the 3rd we were in Pentre’r Graig with year 6 who loved working with TechnoWall-E and TechnoPup made a very quick appearance. The pupils worked hard in teams deciding the best way to get TechnoWall-E through the maze. Both classes got him through the maze in record time. On the 6th I was out in Whitestone Primary. TechnoWall-E loved showing off all the different things he can do like using his colour sensor to get around a track! TechnoWall-E made a few mistakes trying to find the different colours but we had a great discussion about why this might me. TechnoWall-E was also thrilled to hear Whitestone were looking into getting their very own TechnoWall-E! On the 8th TechnoWall-E was out on show in Bryncethin Primar for year 5 and 6. They loved learning all about how we program TechnoWall-E to move and how he uses his sensors. They managed to build a very complicated track for TechnoWall-E to go around which he managed to go around in one go! On the 9th TechnoWall-E and TechnoPup were introduced to year 5 and 6 Tondu Primary School pupils who worked really hard to get TechnoWall-E through the maze. 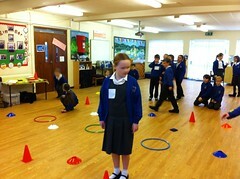 They spent time becoming robots themselves as they learnt about loops and if statements. On the 13th TechnoWall-E, TechnoPup and myself started our 6 day workshop marathon in Cwmclydach primary school with year 6 and year 5. The pupils loved working with TechnoWall-E who taught them how robots work and what you need to do to make them move! TechnoWall-E was really pleased to hear the school have invested in the LEGO Mindstorm NXT sets and had them up and running doing some amazing things! On the 14th we were in Penclawdd primary, the pupils were masters of Fix the Factory app which made them experts at robotics by the time we were ready to program TechnoWall-E through the maze. TechnoWall-E and I saw some lovely Swansea views on our way and way back. We are heading back in December so we much remember to take our camera! On the 15th we were out in Pen Y Fro primary school with year 5 and 6 who spent their time being very precise with their instructions to TechnoWall-E. Their persistence paid off as they cheered TechnoWall-E through the maze! On the 16th we travelled up to Seaview primary in Swansea where TechnoWall-E got the chance to teach year 6 and year 3 all about the world of robotics. Year 6 learnt all about sensors and why it’s important for our robots to have them. TechnoWall-E had the year 3 pupils getting him through the maze! On the 17th we took a day trip to Ynysfach primary school in Neath. 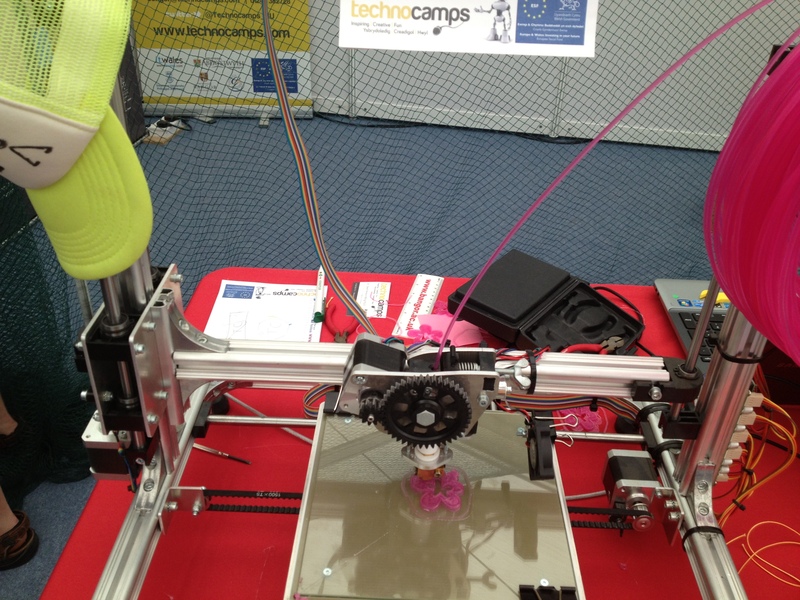 TechnoWall-E spent the day showing the pupils everything robots can do. He showed them that it’s not always easy to program robots, but once the pupils were used to how TechnoWall-E moved they got him flying through the maze! On the 18th TechnoPup finally retired and gave TechnoWall-E full responsibly for teaching the children all about how cool robotics are! TechnoPup has had great fun out in the schools but it’s time for him to retire. Yesterday, the 20th TechnoWall-E and I were in Glais primary with year 5 and 6 who were robotic experts by the end of the session! They had TechnoWall-E in and through the maze before we knew it. 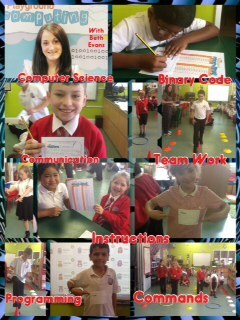 The pupils also got the chance to be turned into robots as they acted out if statements and loops! It has been a exciting month visiting all different schools with the robots and we have a very busy month in November with our robotics workshop as well as our brand new workshop called “How Computers Work” which we hope is going to be a success with all the schools! For now, Wall-E is chilling out in the office charging his batteries before heading out tomorrow in Todu Primary School. 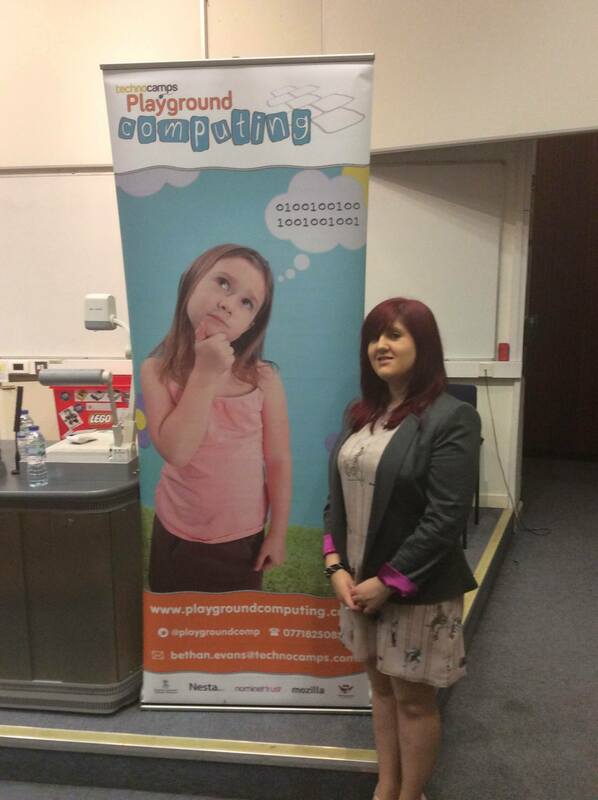 After nearly a year with Playground Computing Beth has spread her wings and flown nest to her next life adventure! I am very honoured to be taking over Beth’s position and love what she has done with the program so far, I hope I can carry on the great work! I am very excited to be out and about in schools and can’t wait to get stuck in! 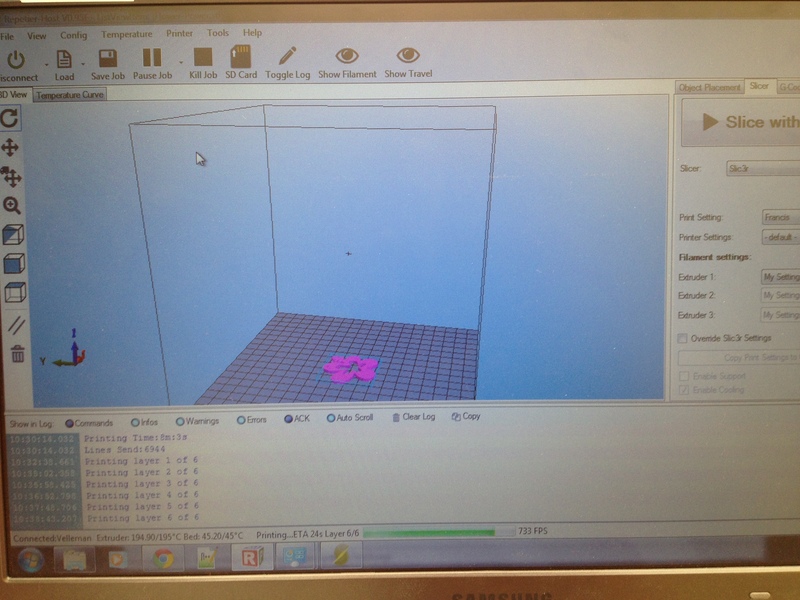 3D printing at the Eisteddfod was a huge success! 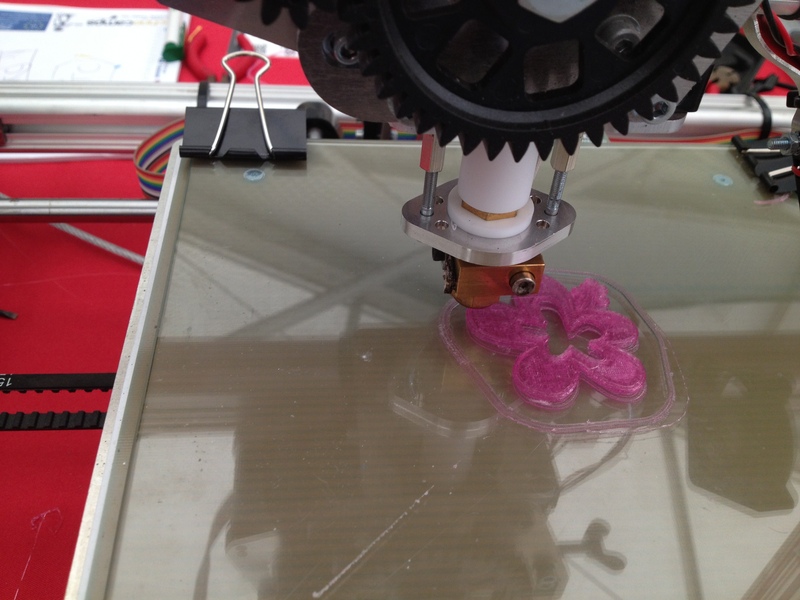 We had a brilliant few days out at the Eisteddfod and both adults and children couldn’t believe their eyes when they saw the 3D printers at work! Some of the shapes we created included a Dr Who tardis, superman necklaces, and the photographs above show how we made necklaces for the girls to take away with them! We also had quad-copters which children enjoyed flying around! It was a fantastic day to share computer science at it’s best. Although school is out for summer, the fun and learning doesn’t need to stop! Next week we are taking the word of computer science out to Wales’s largest festival – The Eisteddfod. The festival which takes place in Carmarthenshire from the 1st – 9th of August will attract thousands of people from all ages and backgrounds. We will be showcasing our work in the hope of attracting some budding computer scientists of the future! If you are going to the Eisteddfod, make sure you stop by to say hello! I had a fantastic day out at St Joseph’s Catholic Primary School yesterday! We had a great time learning about unplugged computer science, and It was a pleasure to be around pupils who were so enthusiastic! I couldn’t believe my ears when I heard that many year 4 and 5 pupils were already experienced at using HTML – WOW! Excellent progress and at such a young age. Mrs Mullan has done a fantastic job of introducing pupils to many aspects of computer science such as; Scratch, Hopscotch, Beebot and HTML. It was also great to see that there was a half built computer on display in the learning pod classroom! What a great way of allowing pupils to see all of the different computer components and hardware. Pupils asked some fantastic questions and I could have stayed and chatted all day. We learned about algorithms, binary code, and we discussed how robots and technologies are developing. Thank you Mrs Mullan for the lovely collage of photographs that can be viewed below. Back again on Wednesday, and cannot wait! What a fantastic day we had out at Porthcawl Primary yesterday. 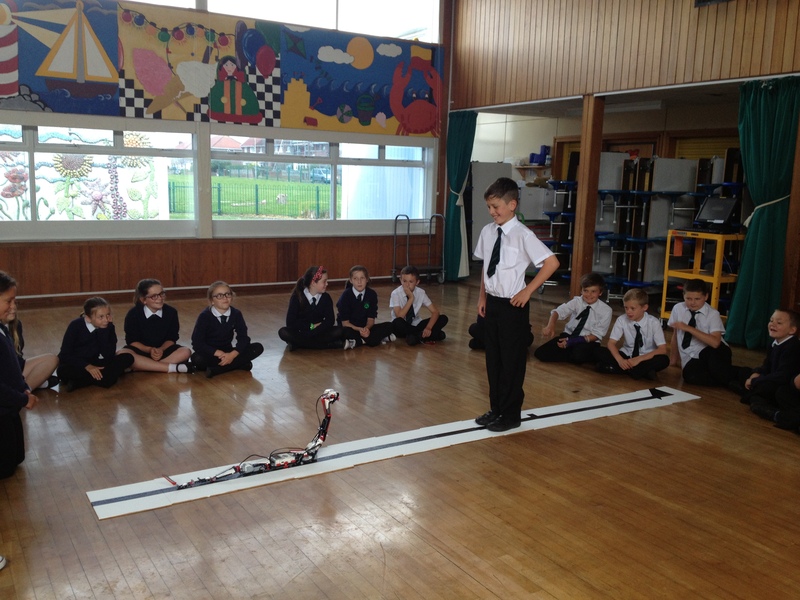 Pupils were lucky enough to see the first official appearance of our fantastic new robot … King Cobra. King Cobra moves and wiggles, just like a real snake! Pupils had lots of fun learning about how King Cobra can distinguish between white and black lines through the colour sensor on the front of him. Pupils also learned that the mechanics of this robot design, makes turning quite difficult. A great response from pupils and a really fun day out at Porthcawl! 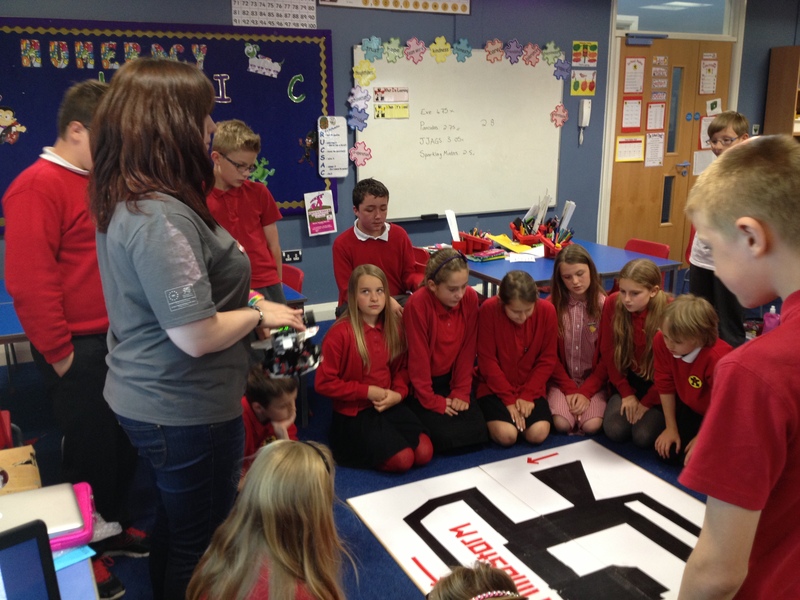 We had an excellent day out at Brackla Primary teaching robotics to year 6 pupils last Friday. We all had a fantastic day! Pupils were fascinated by the robots and were very keen to learn. The behaviour of the class was exceptional! Here is a photograph of Sarah teaching pupils about colour sensors and we supported this by demonstrating how the robot can distinguish between the black line against the white backround. Yet another great day! A huge thank you to pupils and Miss Thomas for such a warm welcome.